Tree Speak | Casey Trees: WHAT DOES .40" OF RAIN LOOK LIKE? The answer is - this. According to the National Weather Service, .40" of rain fell this past Saturday. 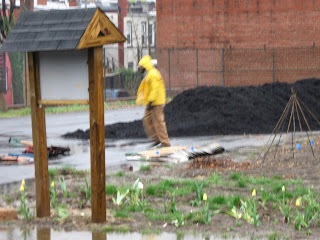 The 16 volunteers and 15 Citizen Foresters who planted 30+ trees at Common Good Community Garden would argue 4" fell. Despite the gloomy skies, everyone had a great time. The added benefit of getting these trees in - better storm water management for this site is well on its way.